Fig. 1—Here’s an example of necking in a formed part. The start of necking (left), easier to feel than to see, gives way to a visible neck (right), not yet split open. A certification of metal properties should arrive with every steel or aluminum shipment. You may know these as metal certs, or YTEs or TYEs, as they list the material’s yield strength, tensile strength and elongation, measured in one tensile test likely taken from the end of a mile-long coil. Minimum requirements for yield, tensile and elongation possibly exist in the specification to which a user ordered the material. Check that these specifications conform with requirements. However, other properties measured in the tensile test better characterize sheetmetal formability. The elongation value reported on cert sheets represents the elongation to fracture, or total elongation. A part that holds water, certainly the minimum threshold as it exits the press line, faces much greater stresses though its life in service. If the forming process results in more strain than the sheetmetal can accommodate, a neck will form. This localized region of significant thinning, known by terms such as smile, weakness, instability, strain and elongation, reveals important details (Fig. 1). A piece of sheetmetal deformed by a punch with an appropriately shaped die face results in your engineered stamping. The sheetmetal must be stretched and drawn around the die face and addendum, and possibly pulled in from the binder area. This metal movement allows creation of deeper, more complex parts with the required features. Once a neck forms, however, global movement stops, with all deformation now concentrated in the neck. The part cannot be drawn deeper as the neck continues to thin and stretch out. Any additional ram motion in the press stroke turns the neck into a split. Before a neck forms, sheetmetal thins uniformly as a function of the deformation. After the neck is created, thinning accelerates. Something similar happens during the tensile test. A tensile bar initially contains a rectangular cross-section. As load is applied to the tensile bar and strength climbs on the stress-strain curve due to work-hardening, the sample cross-section remains rectangular, but gains length and thins. Immediately after reaching ultimate tensile strength, the cross-section begins to form an hourglass shape, which indicates the creation of a neck. As more deformation of the tensile bar occurs, the hourglass shape becomes more distinct. As loading continues, this becomes the site of fracture. 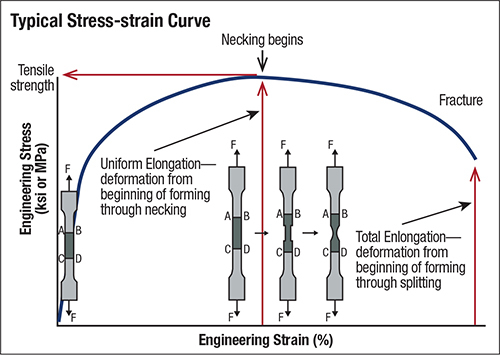 On the engineering stress-strain curve, ultimate tensile strength represents the peak strength. The elongation point where ultimate tensile strength occurs is located at the boundary of the tensile bar having a uniform gauge section on the lower side and the beginnings of a non-uniform cross-section on the higher side. This point, known as uniform elongation, represents the maximum deformation that can occur before a neck starts to form. A related parameter, the strain-hardening exponent, or n-value, measures the degree to which sheetmetal can distribute strain. A lower n-value means that strains will localize quickly, with necking followed by splitting occurring at the site of that localization. 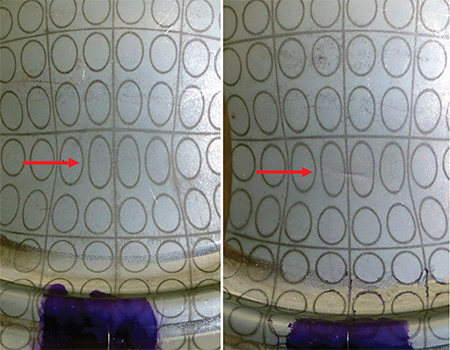 A higher n-value indicates that strains are more uniformly distributed across a part, allowing for deeper draws of more complex shapes before unavoidable strain localization begins. N-value relates to the slope of the stress-strain curve before uniform elongation and ultimate tensile strength are reached. Basically, a higher-sloped curve indicates a greater increase in strength for each additional amount of deformation (Fig. 2). The curve from yield strength to tensile strength does not form a straight line. The slope of the stress-strain curve levels off as force is applied, eventually approaching zero at the ultimate tensile strength. This tells us that if we are going to report the slope of this curve—the n-value—then we also must report the range of data used to determine the slope. When you receive a metal cert, the range over which n-value is calculated must be included in order for it to comply with ASTM standards. Many end-users also require range reporting. An interesting behavioral difference between some steel and aluminum alloys: The more formable grades of each have uniform-elongation values of around 25 percent. Most of these steel alloys exhibit increased ductility after necking but prior to fracture, resulting in a total elongation approaching 50 percent. In contrast, post-uniform ductility in aluminum alloys only increases a few percentage points, leading to total-elongation values of around 30 percent. That’s why you may have noticed little wiggle room between when an aluminum stamping starts to neck and when the part cracks. Learn about evaluating your organization and developing best practices when Bill Frahm from 4M speaks at PMA’s Metal Stamping and Tool & Die Conference in Nashville on January 29-30. Visit www.pma.org/mstd-conference for details and registration.